2017 has been a busy year for Wespray on Paving, but as usual, we’ve worked hard to complete our commercial resurfacing jobs to the highest possible standards, which is illustrated in the below projects. This has been a long-term project of ours, with work spanning across five-years. So far, we’re up to stage 42 and our most recent work on the project is pictured below. 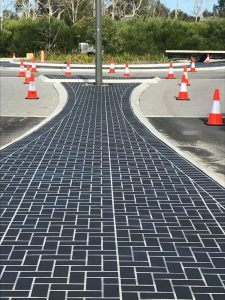 Most recently, we’ve worked on island infill’s, median islands and a roundabout for the crew from RJVincent and Stockland Property Group. 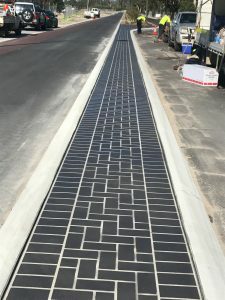 This type of spray on paving work is particularly popular with developers as it requires less maintenance than traditional paving and provides a good defence against weeds and ants. 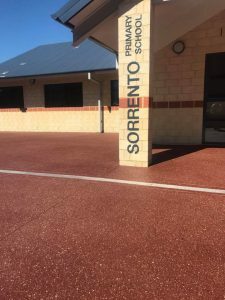 Back in April this year, we were able to help the staff and students at Sorrento Primary School overcome issues associated with their bright new concrete. 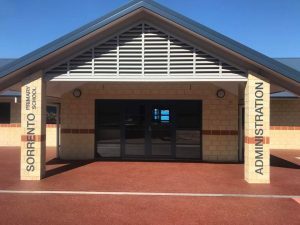 The administration building was surrounded by concrete that was blinding staff and students when the full sun hit it and produced a glare. To overcome this issue, we applied our Oncrete Resurfacing System in a burgundy tone, which blended perfectly with the surrounding brick paving. We also added in a limestone and charcoal fleck to give the surface more of an aggregate feel. The school was pleased with the results, and we couldn’t be happier with the hard work of our team. All of our surfaces are completely sealed, to maintain the vibrant colours and to ensure the surface is protected against stains and easy to maintain. To learn more about our commercial resurfacing work, visit our Facebook page or check out our website.